The P-97 Flaming/Brown type micropipette puller is ideal for fabricating micropipettes, patch pipettes and microinjection needles. While retaining many of the features of earlier models, the P-97 offers improvements in mechanical, electronic and software design. The result is better control of the pulling process and a higher degree of reproducibility. The P-97 combines a proven mechanical system with a sophisticated, programmable microprocessor controller. 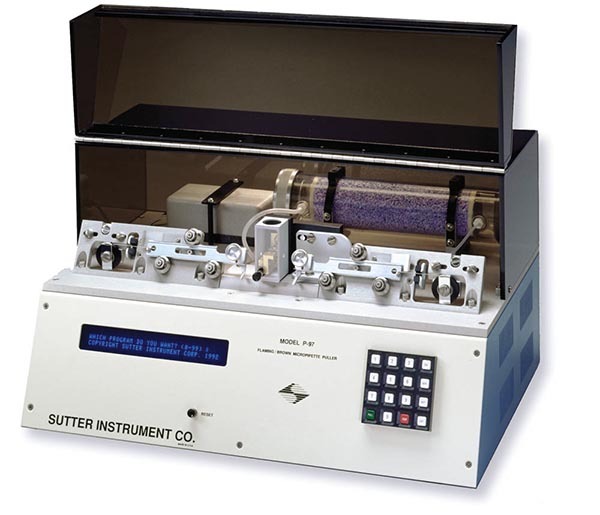 This programmable control of the pulling parameters allows the investigator to design application specific pipettes from a wide range of glass compositions and sizes. A number of other features have been incorporated in the design of the P-97. Most apparent is the environmental chamber which surrounds the heating filament. This environmental chamber is designed to minimize the effect of changing humidity on the reproducibility of pulled pipettes. A 25% increase in power over the P-87 allows for the use of larger heating filaments, larger diameter glass and multi-barreled glass. The metal jaws that clamp the heating filament have also been redesigned to minimize heat retention. A gas delivery mode switch provides for extended cooling for large diameter and multi-barreled glass. A spring-loaded clamping mechanism has been added for easier loading of glass. A vacuum fluorescent display has been added that allows easy viewing. Software improvements on the P-97 include a display of the total heat-on time to assist in program development and troubleshooting. Up to 100 programs can now be written and stored in memory, which makes the P-97 suitable for multiple users. These programs can now be write-protected, adding security to prevent programs from being changed or altered inadvertently. The display shows the last date and time the program was written or edited. In addition, the air pressure is included as a programmable parameter.